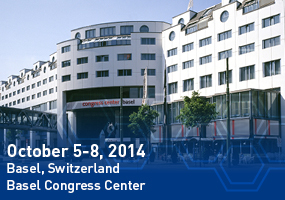 The Scientific Committee is pleased to invite you to Basel for the 15th International Symposium on Preparative and Industrial Chromatography and Allied Techniques, SPICA 2014, which will take place from October 5-8, 2014 at the Congress Center Basel. Since 28 years, this Symposium is « THE » event to attend to keep on the state of the art in the field of Preparative and Industrial Chromatography. Indeed it is a multi-disciplinary forum for specialists active in all branches of fundamental research and practical applications of Preparative Separation Science in the field of chemistry, pharmaceuticals, biology, polymers and biotechnology. During the Symposium, the 3 days sessions will present the latest innovations in the field of purification techniques. The covered topics will range from discovery to process development and to industrial applications. The latest advances in process modelling and innovative processes will be highlighted, keeping the regulatory, environmental and economic aspects into consideration. Recent progresses in the field of stationary phases will also be a topic of the programme, as well as the new trends in membrane, extraction and other purification technologies. During the latest events, the shared knowledge of the different communities created synergies and fruitful discussions that will also be promoted during the 2014 edition. SPICA 2014 is the place where you will have the unique opportunity to meet all key downstream suppliers. For everyone - chemists, engineers and biotechnologists - with requirements on purity, yield and productivity, the Symposium will provide an ideal source of new ideas and opportunities to interact with colleagues from both academia and industry, and to discover the latest trends and needs in the downstream area. Keynote lectures will be given by distinguished chromatography experts, ensuring the established high scientific level of the symposium series. SPICA 2014 will be immediately followed by SFC 2014 in the same venue.